A wedding is always going to be a special occasion no matter who decides to celebrate it. 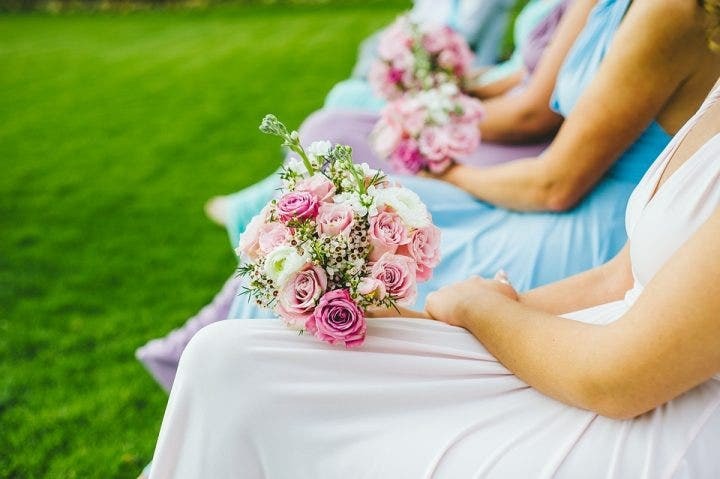 However, one has to remember that they are going to be people that would want to take part in this momentous occasion and both the bride and groom will need to make all the necessary preparations. You may also see blank wedding templates. That being said, it’s important to make these people feel welcome as well as giving them information regarding where certain facilities are or where they’re allowed and not allowed to enter. And, this is exactly the reason as to why one needs to learn how to create wedding signs and this article will teach you what you need to know. You may also see free wedding templates in a word. Having signs at your wedding isn’t just a great way to add more detail to your decor, but it’s a great way to let your guests know where to go and what to expect throughout the entire event. You may also see funny wedding invitations. If you’re going to invite people over to your wedding, then you want them to feel as welcome as possible during your special day. So providing them with a welcome sign which will tell them how happy you are that they’re able to attend is one of the best things that you can possibly do and it’s a great way to kick off the event. You may also see wedding designs. When you put together a wedding, then there will be an order as to what activities are going to take place and when they’re going to take place; this means you’ll want all of the people you’ve invited to know this as well. Let everyone know what they can look forward to with a wedding sign that will give them the timeline of what events are going to take place. This should contain everything from the first dance, the wedding reception, speeches, cake cutting and just about everything else that would take place during a wedding (or at least the things that you’ve planned out for yours). You may also see business sign templates. If you and your spouse are the types who tend to have strayed away from the tradition of separating friends and family into separate tables, then this is the perfect sign that you could possibly make. With this particular type of wedding sign, you’re basically telling all the people you’ve invited that they’re free to sit wherever they want and to whoever they wish to sit next with. This is one of the best ways to give them a sense of freedom as they get to be the ones to choose whatever seat they want to take up during the ceremony. You may also see danger sign designs. Holding means that there are a small number of people that you have deemed so important that you’ve prepared special seats just for them; your spouse will also have these type of people as well. These people would usually be the direct family of both the bride and groom, as well as their closest friends. To make sure that you’re able to let these people know how important they are, you can provide them with signs stating that they’re VIP’s (Very important persons) and that they’re able to access special areas and seats that are solely just for them. You may also see employees only sign templates. If you’re the type of person that would prefer to have your vows being uninterrupted by the sound of camera shutters or phone clicks, then this is definitely the kind of sign that you should consider making. With this particular sign, you’re telling all the people you’ve invited that they are not allowed to use their cameras or phones during the sharing of vows so that they can fully immerse themselves at the moment without any form of distraction. You may also see restroom signs. Do you want to give the ceremony program over to your guests right? Then the best way to do it is with style, and having prepared a well-made ceremony program sign is the best way to go about this. The information that should be displayed on this particular wedding sign would be the names of both the bride and groom, the date of the wedding, and acknowledges your officiant, the parents of the bride and groom and finally the members of the wedding party. This is basically a way to tell all the people who have attended your wedding as to who the ceremony is going to take place and who’s going to be involved. You should never forget to create signs that will help tell your guests where they need to go in the event that they don’t know where it is they’re looking for. So let’s say that you have a couple of guests who have no idea as to where the reception area is, so they end up traversing the entire establishment. The best way to avoid problems such as this is to create signs which easily points them in the direction of where they need to go. Also, you can point them out to other places such as the restrooms or the hall where the ceremony will take place. Just make sure that the signs are simple enough that even a child can understand so that you’ll avoid having people getting lost and missing out on important events. You may also see stop sign templates. You’re going to have to make this particular type of sign whether you’ve organized a seating chart of if you’re given your guests the freedom to choose their own seats. You want to give them a layout of where the tables and chairs are located so that they get to choose wherever they want to sit, or you to give them information as to where they’re being designated. Be sure to display the details at the reception entrance so that you can start the wedding reception as soon as possible! Do you have a selection of drinks and dishes that your guests can order at any time? Then you’ll want to give them all the information they need regarding what these drinks and dishes are. So you’ll need to create order signs that contain short descriptions of these drinks and dishes so that your guests can come up with what they want to have. You may also see no pets sign templates. A wedding without any form of entertainment is going to be a boring one, so you’ll want to tell your guests that you have all the entertainment they could possibly need, as well as telling them what kind of entertainment they can expect. So whether it’s a fun photo booth or unique guest book idea, if there’s anything you’d like your loved ones to get involved in, then be sure that you have a sign to tell them! Just make sure that you give them all the details from what kind of entertainment it is to the location of where they can make their way towards it. You may also see no exit sign templates. Favours are basically small gifts that you’re willing to hand out to the people who made the time of day to participate in your joyous occasion. You want to make sure that the people you’ve invited are aware that you have small gifts for them and that they’re able to bring them home. So what you’ll need to do is create a small sign next to your thank you gifts to ensure that everyone gets what they deserve. 2. 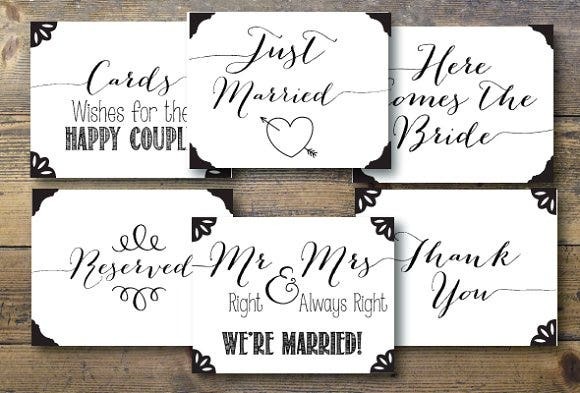 Make the Designs Match the Theme of Your Wedding – You want your signs to be as attractive and as pleasing to the eyes as possible as your guests are going to take a look at every single one of them to see what information they convey. Be sure that the images, background, and even the font style goes well with whatever wedding you decided to go with so that it matches the decor. 3. Do it Yourself – If you think that you have more than enough time to spare, then it’s best that you make the wedding signs yourself. This way, you can give it your own personal touch and you can make sure that the signs have everything needed to provide your guests with information. If you’re having trouble in knowing what it is you should put into the signs or if you don’t quite understand the ways in which you should go about in the design, then you can always go online and search for examples to give you an idea as to how you should go about in making them. You may also like dog sign templates. 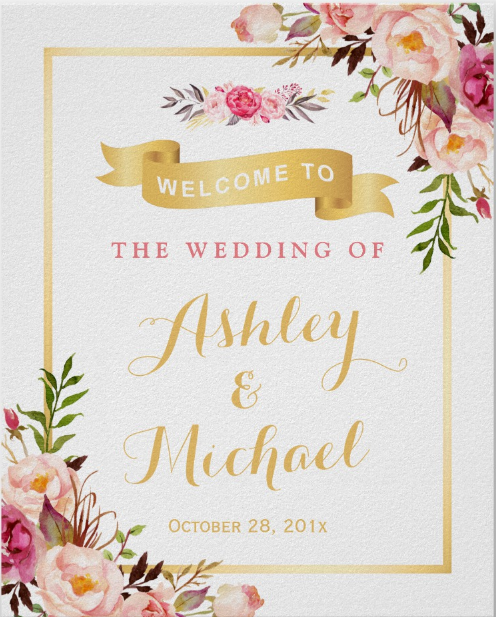 In the event that you would like to learn more in regards to how you can go about in creating wedding signs or if you’d like to create other types of signs, then all you have to do is go through our site, find the articles that contain the information you need, and utilize what you’re able to gather to help you. You may also like no smoking sign templates.